Singapore is the best tourist place where people relieve from the stress of their daily life. Singapore is a perfect holiday destination of all age group. The older ones can relax in the greenery and young ones enjoy an adventure at Universal Studio. Singapore is a City-state situated at the southern tip of the Malay Penisula in Asia. It comprises of the precious stone moulded Singapore Island and exactly 60 little islets. It's the best place for the foodies, adventurers, thrillers and love to do something new. Singapore is a city which is continually developing always reinvent itself in new dimensions. Singapore is known for its sky high building and posh shopping mall. Singapore has a numerous atraction points where you can sink yorself with full of enjoyment. The most popular attraction is Garden by Bay where we found a number of species of trees, green parks and sanctuaries. Singapore is popular as "Garden City" has the world's largest greenhouse and flower dome. It is located at the Marina Bay covering 101 hectares of reclaimed land. This nature's park main aim is to reinforcing greenery and flora to bring the quality of life in the city. The park comprises three magnetize waterfronts garden – Bay South Garden, Bay East Garden, Bay Central Garden. The Bay Central Garden links Bay South and Bay East Gardens. It covers the area of 15 hectares in which 3 Km waterfront promenade. It allows the travellers a scenic walk stretching from the city centre to the east of Singapore. The Bay East is covering the area of 32 hectares. It has 2 Km promenade frontage bordering the Marina Reservoir. It gives unleashing view of the city skyline to its visitors. Universal Studio is the most distinguished travelling spot in Singapore. It is a theme park consists of 24 rides, shows,and seven themed zones which enthralled travellers in it. Universal Studio is a Southeast Asia's first Hollywood film amusement stop.It is situated inside Resorts World Sentosa on Sentosa Island, Singapore. The number of activities for the adventurous and thrilled lovers. People are so entertained that they overwhelmed and rapturous, having unbeatable journey of enjoyment. 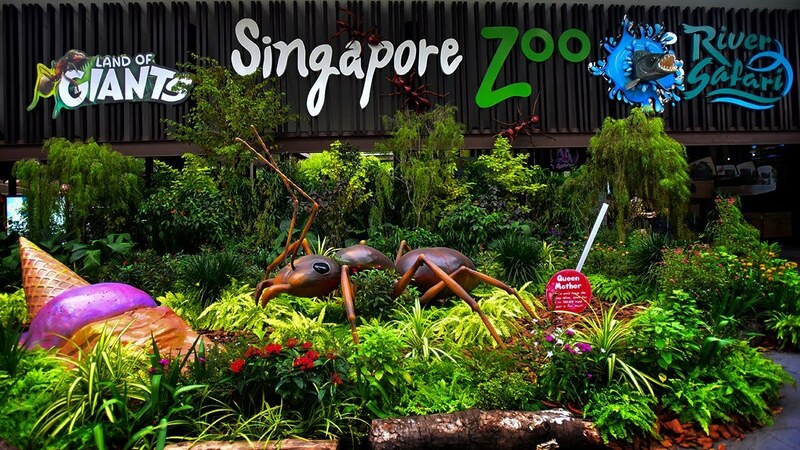 Singapore Zoo is one of the first zoo safari in which we have a night safari, giving a chance to take breakfast with orangutans.It has a number of sections to see, so you need a full day schedule to see all the sections. Wings of Time is a show consists of lasers, fireworks, 3D project mapping, and robotics water fountain. It is situated on Silosa Beach at sentosa Island where 2500 spectator unassumingly watches the show. This incredible show was made by the award-winning French show organization ECA2. It's a night show which describes the storyline in the open sea. Two shows are presented daily- 7.40 p.m and 8.40 p.m.
Madame Tussauds is a wax sculpture studio where we come face to face with famous personalities of the world. It is located at the Imbiah Lookout of Sentosa Island in Singapore. People love to take a snapshot with different political identities, superstars, sportspersons and many more. S.E.A Aquarium is the world largest aquarium where more than 1, 00,000 marine animals are found. The world largest 36-m wide view panel which is projected to give visitors the feeling of being on the ocean floor. More than 1000 marine species are collected from the different sea in the world which is extremely mind-blowing. Explore the sea life in Marine Life Park where we found more than 1,00,000 marine animals. Dive into Marine Life Park, an aquatic world, the world largest aquarium where we find more than 800 species. Marine Life Park has two main features S.E.A Aquarium and Adventure Cove Water Park. Singapore Aquarium gives you awesome experience of marine life. The visitors not only enjoy in the S.E.A Aquarium but also take handful memories with them that are everlasting and unforgettable.